Really PSA from FMHS The Buzz TV on Vimeo. “Really?” won an Emmy. No, “Really?” , a video public service announcement really did win a regional Emmy. 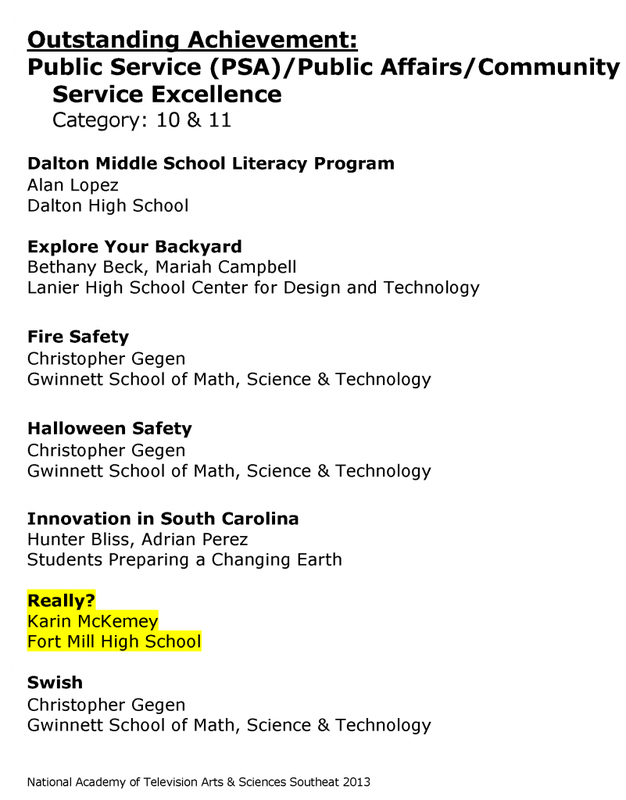 Fort Mill High School TV Production students Sawyer Bengtson, Mark Caponigro, Ryan Long and Mason Strohl produced a public?service?announcement last year called “Really?”. Other Tweets from?friends, supporters?and students echoed?Karin’s happiness and?excitement for her students. The video project foursome was up against 6 other ?schools in the category of Public Service (PSA)/Public Affairs/Community Service Excellence. Their PSA video project promoted checking ?facts before students spread information. ?A great?message?since social media is now a way of ?life for most students. The students used time?lapse?techniques?to?create?the creative posted note scene in their video. The TV Production class is well known for?their?popular weekly TV show called FM BUZZ TV. Now they will be well known for winning an Emmy! ?Congratulations?to Sawyer, Mark, Ryan, Mason, and Karin for a job well done, Emmy style! Click to view ?the?Buzz TV FM Video?Channel on?You Tube. Side note: Karin has?produced?videos for Carmen. See her videos?